Accepted Scientific Name: Pachypodium horombense Poiss. Bull. Acad. Malgache 1922-3, n. s. vi. 165 (1924), in obs. et in adnot. Origin and Habitat: Horombe plateau in southern Madagascar. Altitude range: 500-1000 metres above sea level. Habitat: It is found in granite outcrops on hilltops, which are also home to some of Madagascar's rarest species, for example Pachypodium brevicaule, Euphorbia quartziticola, Aloe calcairophylla, Aloe isalensis and Schizolaena tampoketsana. Pachypodium horombense f. cristata hort. 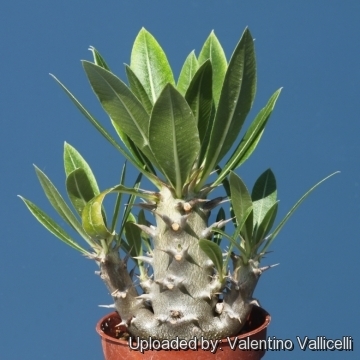 Description: Pachypodium horombense is a succulent shrublet about 1.5 m high with a plump, bottle-shaped, main stem surmounted by a number of short, spiny fat arms each bearing a rosette of leaves and a single long-peduncled inflorescence that carries 3-10, broadly cup-shaped, horizontal, gold flowers during the warm months of the year. The flower has an inflated corolla that forms five large sacs into which the pollinator can crawl. 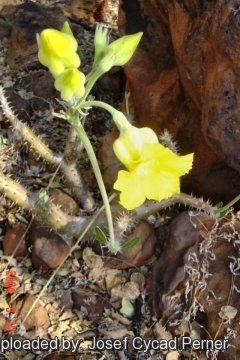 Unless in flower, it's difficult to distinguish it from the cactus pachypodium (Pachypodium rosulatum). 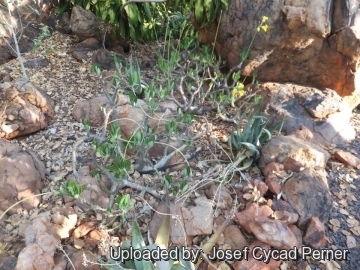 Habit: P. horombense is a succulent shrub or dwarf tree up to 60 cm high similar to Pachypodium rosulatum but with stiffer, more erect stems branching nearer to the base. 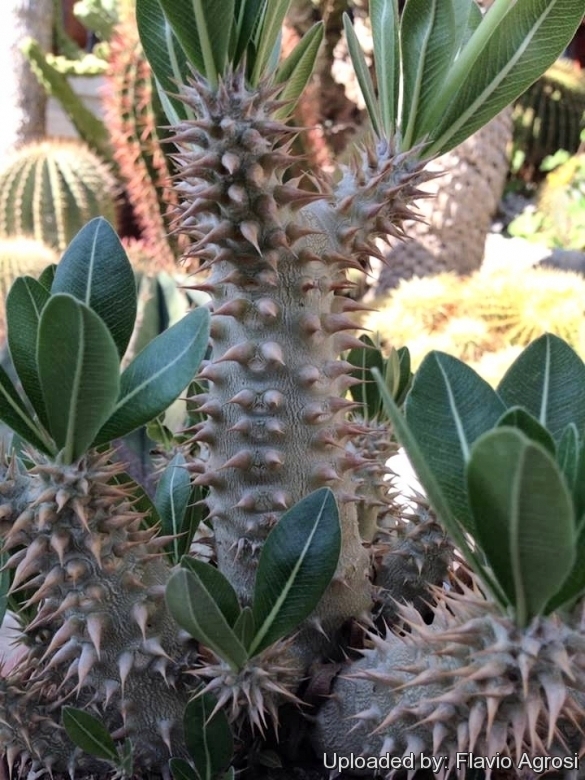 Stem: The cactus-like trunk and branches are covered with short paired spines. A plump tuberous base often called a caudex 50-70 cm in diameter, is also present, it is a swollen trunk-root transitional area that stores water. Trunk, 20-30 cm in diameter; bark grey-green, shiny, smooth, medium green, wood cream. Branches up to 10 cm in diameter; branchlets 20-40 cm long and 6-20 mm in diameter, not linear but variously twisted, bent and gnarled, covered with paired straight spines, 3-10 mm long, 1-3 mm in diameter at the base, basal part conical. Leaves: Thick, stiff, subsessile in a whorled tuft on branch tips elliptic to narrowly oblong 25-80 mm long 5-20 mm broad rounded at the apex, wedge shaped at the base. Petiole 1-3 mm long, pubescent. Deep green, glossy, with a pale green or yellowish midvein and secondary veins above and felted, white undersides with again paler midrib and dark green reticulate venation. Papery when dried. Completely deciduous in winter As temperatures cool and soil dries out in the tropical winter, the foliage drops away. Inflorescence: 4-11-flowered an an upright pubescent, peduncle, 10-60 cm tall, 3-8 mm wide. Pedicels 5-45 mm long, pubescent. Bracts pale green, oblong to obovate, 8-25 mm long 2-6 mm wide, acuminate at the apex sometimes hidden by the hairs. Flowers: Chrome-yellow. Sepals pale green, fused at the base for about 0.5 mm, ovate 6-15 mm long 2-4 mm broad, acuminate at the apex, pubescent outside, glabrous inside. Tube broadly cup-shaped, 17-23 mm in diameter, 5-lobed in cross-section with dark red longitudinal lines in bud, pale green in open flowers. Corolla bright yellow, 2.5-5.5 cm long in the mature bud and forming a comparatively wide ovoid head. 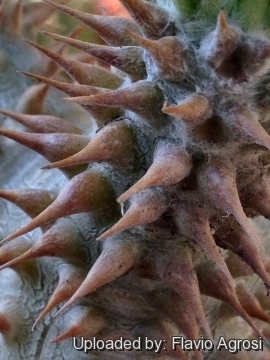 Basal part almost cylindrical, abruptly widened where the stamens are inserted into the upper part which is urceolate, 18-40 mm long, 15-26 mm wide at the mouth, with 5 again widened parts below the lobes and therefore 5-winged inside; lobes obliquely and broadly obovate. Blooming season: During the warmth and increased moisture of late spring and into summer, thin flower stalks tower above the leafy branch tips. Fruits: 14 cm x 7 mm. 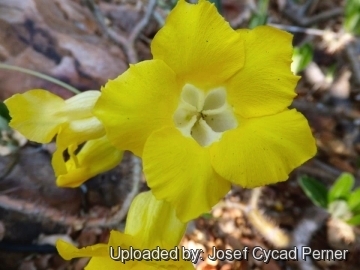 A wild hybrid has been recorded with Pachypodium densiforum. 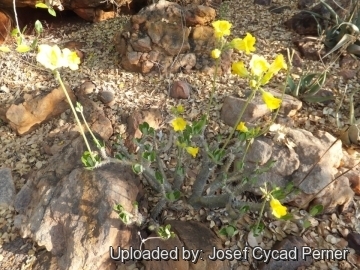 Pachypodium horombense Poiss. : has flowers with inflated corolla that forms five large sacs into which the pollinator can crawl. Distribution: Horombe plateau in southern Madagascar. Pachypodium horombense f. cristata hort. : Crested form. 5) Rapanarivo, S. H. J. V. & A. J. M. Leeuwenberg. “Taxonomic revision of Pachypodium. Series of revisions of Apocynaceae XLVIII.” in: Rapanarivo, S. H. J. V. et al., "Pachypodium (Apocynaceae): taxonomy, habitats and cultivation." 1999. 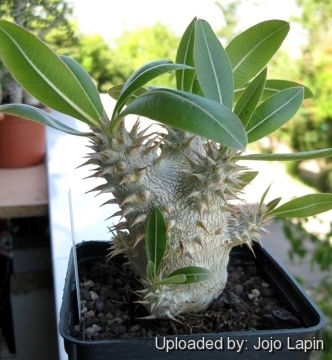 Cultivation and Propagation: Pachypodium horombense is one of the most attractive species in the entire genus that can be grown both indoors, as well as outdoors in warm climates. It’s a moderate grower and an impressive caudex can be steadily developed. In the winters it is deciduous, except in very tropical areas. Pretty cold sensitive- supposedly prone to rot if wet in winter cold. 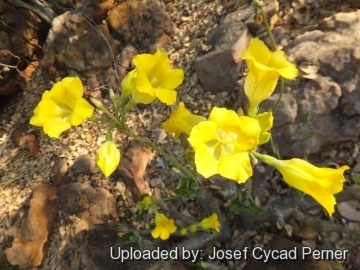 It may be grown as a specimen among rocks and low-growing plants in a hot rockery. It may also be grown in a heavy container on the sunny patio. Maintenance: This Pachypodium will not require any pruning to look like a very interesting and unusual bonsai, but after several years it can outgrow its indoor location, requiring a 'pruning'. It has amazing regenerative properties.